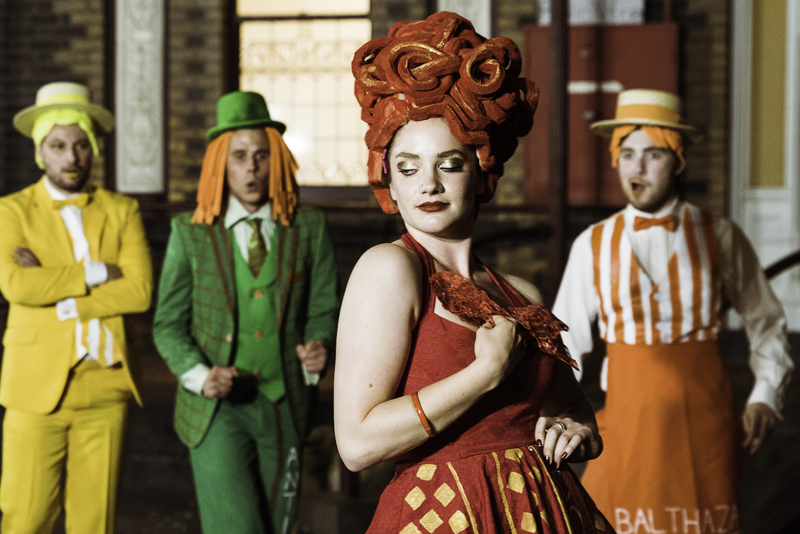 Melbourne Shakespeare Company delivers their most powerful production yet, with Comedy of Errors maintaining the energy and vibrancy of their previous productions and taking it to almost surreal heights. Jennifer Sarah Dean directs Comedy of Errors, an early comedy following two sets of twins separated decades ago during a shipwreck. After years of searching, both twins find themselves in Ephesus, where Antipholus of Sycaruse and his servant Dromio find themselves mistaken their brothers, while Antipholus and Dromio of Ephesus wonder why people keep accusing them of things they’ve never done. They’re tropes that have been seen countless times since, but rarely presented in its Shakespearean form. But the company shows that backed with a strong director and ensemble, the lesser performed piece has all the potential to be as hysterical as its better known twin Twelfth Night. Comedy of Errors develops into such an ensemble piece it becomes almost impossible to single out individual cast members, instead being all too easy to get completely swept up in their world and the story they have to tell. Many roles become one scene wonders, while others are given the attention they don’t receive the the text and insert themselves into the play, refusing to let the audience forget then. 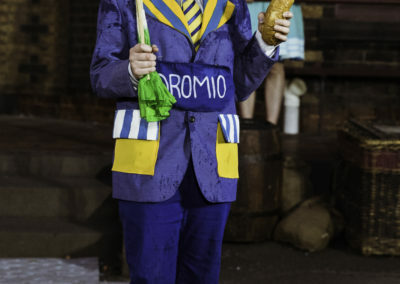 While the audience narrowly avoided the rain, the cast wasn’t so lucky, ended up covered in cream pies, confetti and each-others’ boot prints by the end of the night and taking it all in their stride. The physical comedy is well timed and hysterical, strengthened by having the same infectious energy flow through the lines. 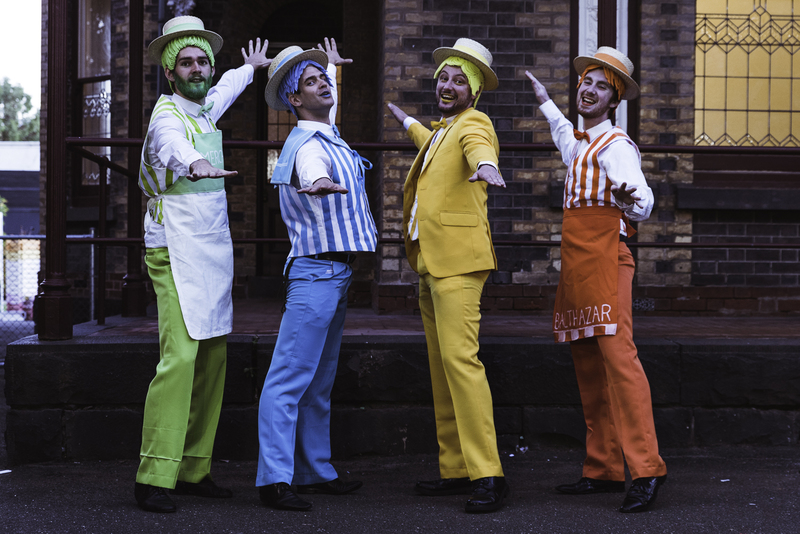 Ben Adam’s musical direction is seamlessly interspersed through the production by the Mer-chants (Andrew Iles, Mitch Ralston, Ryan Smedley and Patrick Hill), a barbershop quartet doubling as ensemble characters. Songs span decades and swing between The Chordettes and One Direction with ease, and it provides opportunities for giving seemingly forgettable roles as the “First Merchant” or “Second Merchant” a life of their own and the ability to steal the show. This is Dreamworks Animation, done right and at its peak. 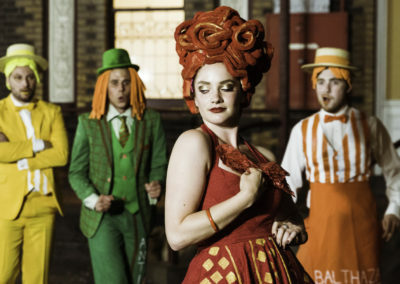 Rhiannon Irving’s vibrant, almost blindingly bright costumes are larger than life and out of this world and take the audience to the world of Saturday morning cartoons from the moment the cast emerges and begins to weave through the audience. 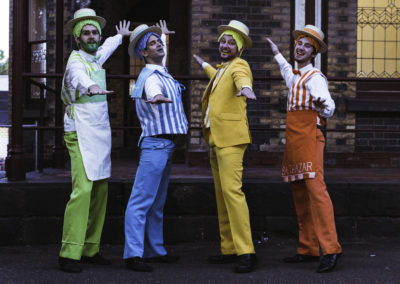 Behind the wigs, makeup and colourful suits, the twins Antipholus (Johnathan Peck and Nathaniel Schneider) and Dromio (Nicola Bowman and Madeleine Stewart) were at times almost difficult to tell apart, making the chaotic mistaken identities even funnier in its believably. The backdrop of Siteworks almost becomes a character in its own right as the Ephesus manor house. The casts’s use of space keeps the audience constantly on their toes, watching and listening out towards the upstairs windows and balconies for someone throwing down eggs or a chorus starting up. Between all the pop culture references interwoven through the performance, it’s hard to resist a few modern comparisons. This the surreal, colourful world of Doctor Seuss. This is Dreamworks Animation, done right and at its peak. And this is Melbourne Shakespeare Company creating something that is uniquely its own. 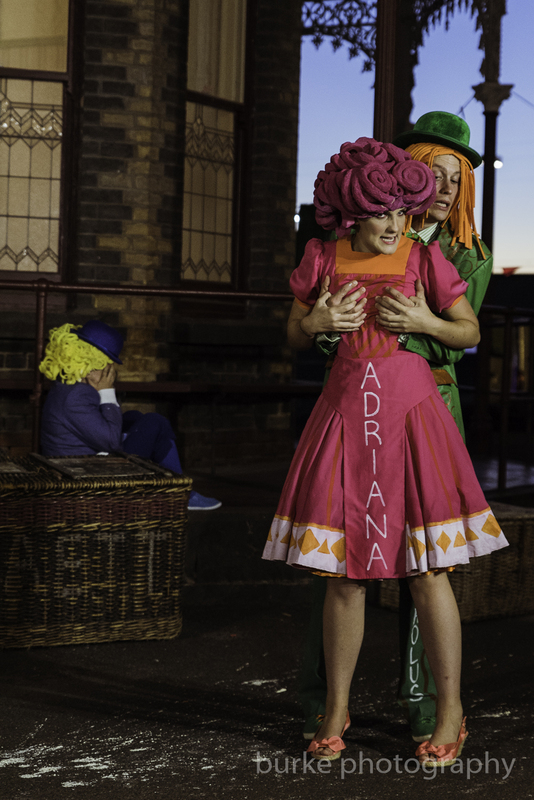 Click here for Comedy of Errors performance dates, ticketing prices and more information. Andrew Iles, Mitch Ralston, Ryan Smedley and Patrick Hills as the Mer-chants. By Burke Photography. Madeleine Stewart as Dromio and Lelda Capsis as Luciana. By Burke Photography. 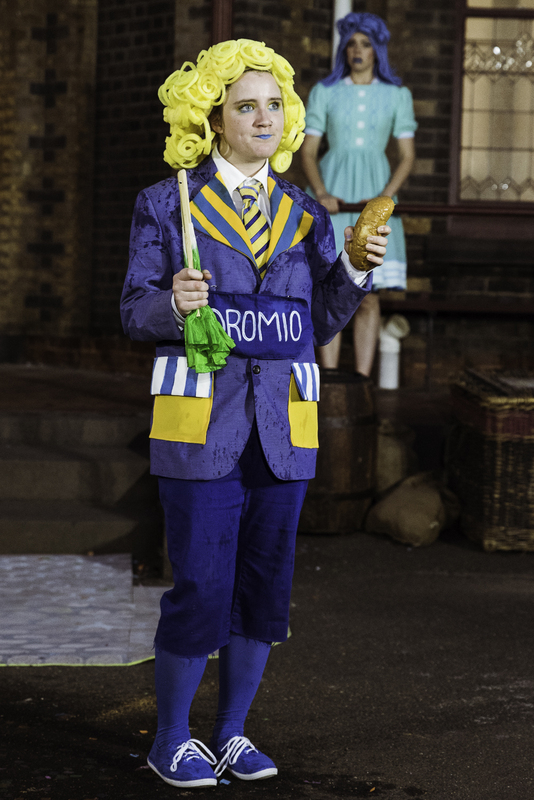 Nicola Bowman as Dromio, Johnathan Peck as Antipholus and Jacqueline Whiting as Adriana. By Burke Photography. Andrew Iles as Mer-chant, Nathaniel Scheider as Antipholus, Annabelle Jane as Courtesan and Ryan Smedley as Mer-chant. By Burke Photography.